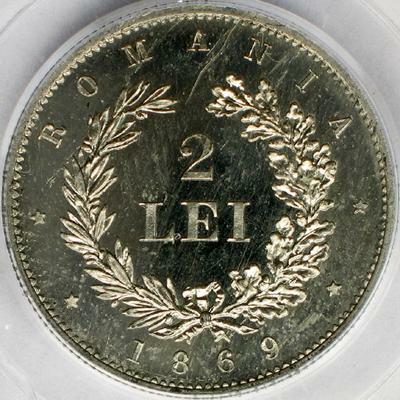 face value "2 LEI" between laurel and oak leaves, ROMANIA, year 1869 flanked by two five ray stars on each side outer pearl circle, inscription "CAROL I° DOMNU AL ROMÂNILOR." 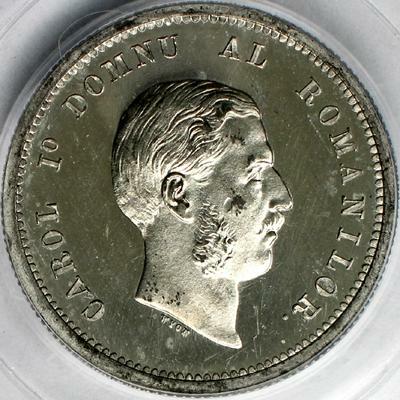 meaning "CAROL THE 1st PRINCE OF THE ROMANIANS", the head of the prince facing right (with side whiskers). Under the neck lies WYON, the engraver's name. Romanian numismatics knows lots of monetary patterns, many of them being presented inside monograph Monede şi bancnote româneşti by George Buzdugan, Octavian Luchian and Constantin Oprescu (1977). 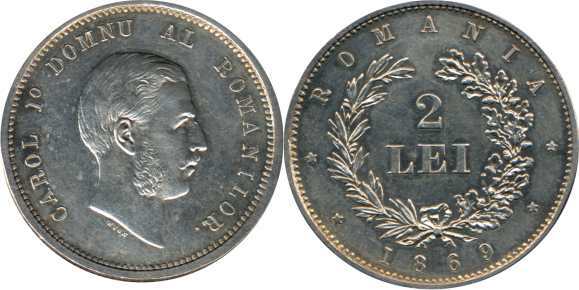 This piece that could have been the first silver modern Romanian 2 lei coin appears at position 197. The first pattern pictures and the detail above are present on Romanian coins through the kind permission of an anonymous donor. The second pattern pictures above are present on Romanian coins through the kind permission of Mr. J. M..